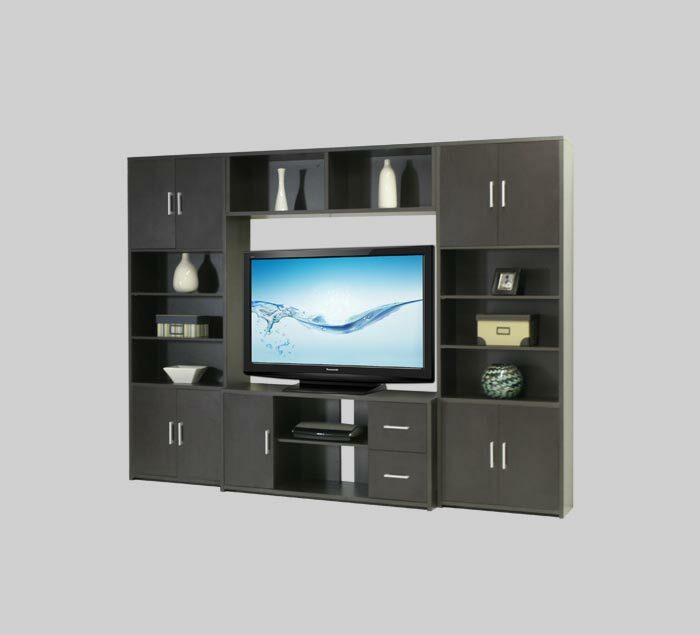 The Stockton Entertainment Center embodies the perfect balance of open display space and concealed storage. This modular wall unit is large enough be the focus of your living room or family room, with a transitional style that looks great in several finishes (pictured in wenge) without commanding too much attention. This entertainment center frames your flat screen TV with space for accent pieces, while DVDs and media can stay nearby but out of plain sight. The 54" TV opening is perfect for 42 inch and 50 inch TVs, and will even accomodate most 55 inch class televisions. The center console has two open areas with easy access for wiring your electronics, fully extending drawers for media storage, as well as a deep cabinet for additional space. Pier cabinets offer just enough open display space, with shelved cabinets on top and bottom for more organized media storage. The closed back bridge above the TV opening completes the balance.